I live with my wife Sheila in a historic town called Drogheda 30 miles north of Dublin. We have an Edwardian terraced house with a long garden within walking distance of the town centre and transport facilities. 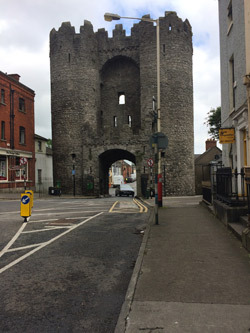 Drogheda was a walled town, so at the end of our road is the only surviving medieval barbican in Ireland, a magnificent beast called St. Lawrence Gate. A few miles up the River Boyne is Newgrange, the oldest man-made structure in Europe, older than the pyramids. The site of the Battle of the Boyne is near there, Oliver Cromwell is still detested for his brutal massacre when he broke the siege here, and the head of another Oliver, St. Oliver Plunkett, is a somewhat gruesome relic in St. Peter's Catholic Church. The people here are very friendly. For a time I ran the local creative writing group, Drogheda Creative Writers, and organised its events, such as the Amergin Creative Writing Awards and very successful poetry slams. DCW also published two anthologies Drogheda Writes and Drogheda Writes 2, both co-edited by me and packed with poems, stories and memoirs of pleasingly high calibre by local writers. Our commuting to Dublin is primarily for childminding for our son Simon’s two children Alana and Oisin and for my poetry and art activities. Flights to the UK are mainly to catch up on our younger son Brian, who has a growing telecoms business in St. Albans another historic town, and his children Tara and Lincoln Jae. How I ended up in Drogheda is a complicated story. I grew up in Bramley, a country village in Surrey near Guildford as an evacuee from London during World War II. I went to the village primary school across the road, passed the very new 11-plus exam to enter the Royal Grammar School in Guildford, a very dark gloomy Tudor building. Early writing included tapping out a science fiction story on an ancient one-key, one-character-at-a-time revolving-drum typewriter. I did National Service in the RAF, serving as a photographer in a fighter squadron in Germany and was released two weeks early to go to University College London to read Economics with International Relations. That was 1956, so it was an exciting time. The Suez and Hungary protests were on, it was the skiffle, jazz, coffee bar era and the start of rock & roll, the time of Angry Young Men in literature, Kitchen Sink drama and Theatre of the Absurd in theatre, and the French Nouvelle Vague in cinema. We had a whale of a time and in those days a county major scholarship was enough to live on. I did come out with an honours degree but most of my education (or is it training) was from working on the college newspaper, dramatic society, film society and being on the students union council. My big mistake then was not having a one-track career plan but wanting to do everything, so I ended up doing a bit of a lot of things. Looking back, it was mainly work in different forms of writing and editing from journalism to technical editing, publicity to scripts for corporate videos, information and careers literature with occasional attempts to break into the film industry. This included four years as a founding editor of the innovative theatre magazine Theatre Quarterly, while researching a series of careers books took me into industrial premises like foundries and shipyards I had never expected to see. This was supplemented by a lot of voluntary work in my spare time organising productions at the influential Unity Theatre and in community organisations. Various fiction and non-fiction books were mooted and even part-written but put aside for pressure of earning a living. So I met a lot of people and accumulated masses of experience of how industry and society operates and that’s something that comes in pretty handy when writing a novel even an historical one. With our sons grown up, about 20 years ago we decided that London was too big and unmanageable and dirty and car-dominated, so we moved to inner-city Dublin, where my wife grew up. That was fine, much more relaxed and I was able to take time for some solid writing - Death Comes by Amphora was one of the results, though it has gone through considerable changes since that first draft. But then Dublin started trying to imitate London, so we moved in 1993 to Drogheda. Drogheda then expanded rapidly as a Dublin commuter base trying to emulate the capital, but the recession and financial crisis put an end to that and closed many of the shops. But it still remains the friendliest town I have ever lived in. 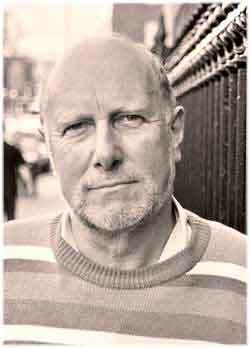 I am a member of the Crime Writers Association, the Classical Association of Ireland and Classical Association (UK), the Historical Novel Society and Visual Artists Ireland, Poetry Ireland and the Poetry Association (UK), and have dual Irish/British nationality.